Last week the High Court in London declared that the UK government must have a free vote before Article 50 is invoked [BBC]. But there has been a stream of anger both in newspapers and on social media following the ruling. The ruling [PDF] has upset the Prime Minister's plan to invoke Article 50 using the royal prerogative [Guardian]. But it has also unleashed a stream of attacks upon the judges and those who brought the case. Indeed Gina Miller, who brought the case, has been subjected to online abuse which has even included death threats [Independent / Sun]. The reaction to the court decision by former UKIP leader Nigel Farage was immediate and robust. "I now fear every attempt will be made to block or delay triggering Article 50. They have no idea level of public anger they will provoke," he wrote on Twitter. Speaking on the Andrew Marr Show on the BBC Nigel Farage reiterated his opinion that anger over any dilution of Brexit could spill over into anger on the streets, something that some have likened to Enoch Powell's infamous "Rivers of Blood" speech. "Believe you me, if the people in this country think they're going to be cheated, they're going to be betrayed, then we will see political anger the likes of which none of us in our lifetimes have ever witnessed in this country. Those newspaper headlines are reflecting that." He spoke too of a feeling of betrayal by the government and questioned whether the judiciary should be independent. "After today's judgement I'm really beginning to question the independence of our judiciary," Farage tweeted soon after the High Court ruling. Farage's view was repeated by other UKIP members. Candidate in the UKIP leadership race, Suzanne Evans, said she felt that judges "should be subject to some sort of democratic control" or even sacked [BBC / Sun]. Both her and Farage's views were reflected on many of Britain's Brexit leaning press. The day after the ruling, judges were labelled as traitors and enemies of the people [Guardian]. The gay community was far more angry however. Pink News and other papers representing the gay community quickly responded to the vitriol pouring from the right-wing paper. The MailOnline soon removed the references to Sir Terence's sexuality in the headline [PoliticalScrapbook]. But for some it was clear that many papers had become an outpouring of almost fascistic propaganda. 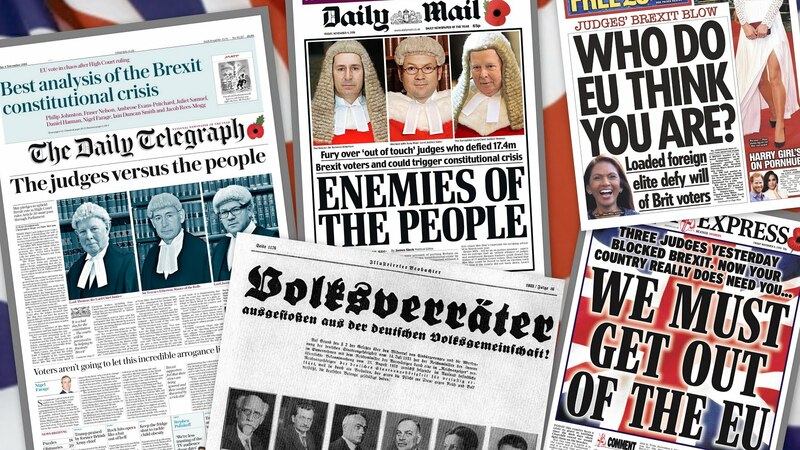 Many people began to liken the Daily Mail with the Nazi leaning paper Völkischer Beobachter which in 1933 ran with similar headlines whilst condemning judges that failed to follow the party line. One senior Church of England bishop said people in Britain should be "very alarmed" at the way newspapers reacted to the High Court decision Parliament must vote on triggering Article 50. "The last time we saw things like the photographs of judges on the front page of a newspaper described as enemies of the people is in places like Nazi Germany, in Zimbabwe and places like that," Nick Baines told BBC Radio 4's Sunday programme [Independent]. It is not the first Nazi association. Even before the EU referendum a UKIP refugee poster bore a striking similarity to an image from Nazi propaganda film and Farage himself was accused of stoking up the flames of xenophobia, racism and intolerance [RT]. The irony that Brexit is now being used to target the Left, Gays, foreigners, refugees and now judges will not be lost on some who feel that the country is gradually moving further to the Right wing of politics. 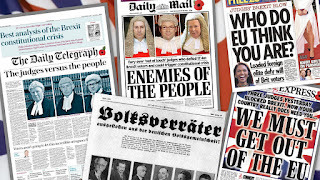 The fallout from the Brexit has continued with a surge in racism, hate crime and now it appears a gradual leaning of newspapers towards fascism. But he also spoke of the difficulties faced by Britain should it not retain access to the European single market [Radio Australia] . A trade deal with India is absolutely imperative, but there is a significant risk Britain might lose its business relationship with the world's largest democracy if Britain's European relationship sours [BBC / Guardian]. India relies on Britain's access to the single market to trade inside Europe and this is something which appears to be something the British PM seems willing to abandon. With immigration being seen by May and her hard line Brexiteers as a red line, access to the single market will be difficult to maintain. Bilimoria is not the only business leader to have stepped forward to attack the government over their immigration policy. Many are worried that curbs will mean they cannot recruit the staff they need to keep their firms running smoothly. Seamus Nevin, head of employment and skills policy at the Institute of Directors, said, "Businesses know that the EU referendum result means change to free movement of workers from the EU, but people were not voting to make the economy weaker. The evidence is clear that migrants are a benefit to the economy." Adam Marshall, director general of the British Chambers of Commerce, has also raised concerns. "Businesses across the UK report skills shortages on a number of different levels. Firms are pretty clear they will need workers from overseas with various skill levels in the years ahead," Marshall said [City A.M.]. Uncertainty is the only thing that remains certain. And that uncertainty may continue for at least two years as Britain negotiates its exit from the EU. Even at the end of the two year process, which will only begin after the triggering of Article 50, Britain may still have not clear trading position with the 27 nation trading bloc - or indeed any other nation around the globe. Last week Polish MEP Danuta Hübner said Britain cannot negotiate a free-trade agreement until it has left the European Union [Guardian]. Indeed issues surrounding the single market, the customs union, free movement and immigration in general, remain unclear. There is still no clear indication on what type of Brexit the government wants. David Davis, the Secretary of State for Exiting the EU, merely repeats the line that the electorate have given a clear mandate that they wish to leave the EU. He has also dismissed the assertion the referendum was merely advisory, something which even Nigel Farage has been forced to admit [Independent]. Indeed this issue was clearly stated prior to the referendum, but not widely known [Guardian]. The road ahead looks even more bumpy than many may well have foreseen [Guardian]. Meanwhile investment is beginning to slow as uncertainty forces many companies to rethink their position [BBC]. And for consumers prices look set to rise further, the latest victims being Birds Eye products and Walkers crisps [BBC / Guardian].